Remember that feeling of being a freshman in college – that moment in life when you know that you’re no longer a kid, but you’re still not quite sure of how to define yourself as an adult? That is where I was when I first fell in love with Nepal. Truth be told, I wasn’t actually in Nepal at the time. I was in a large auditorium at NC State University. A professor was at the front of the room giving a presentation on a new study abroad program. I was politely listening, but I’d already decided that when the time came for me to study abroad, which would be the spring semester of my junior year just like everyone told me it should, I was going to go to Italy. …And then the moment came. It was a moment like in all those sappy country songs where the singer talks about being instantaneously mesmerized by a beautiful woman as she walks into the room. The professor walked in, put up a picture, and I was caught in the spell. 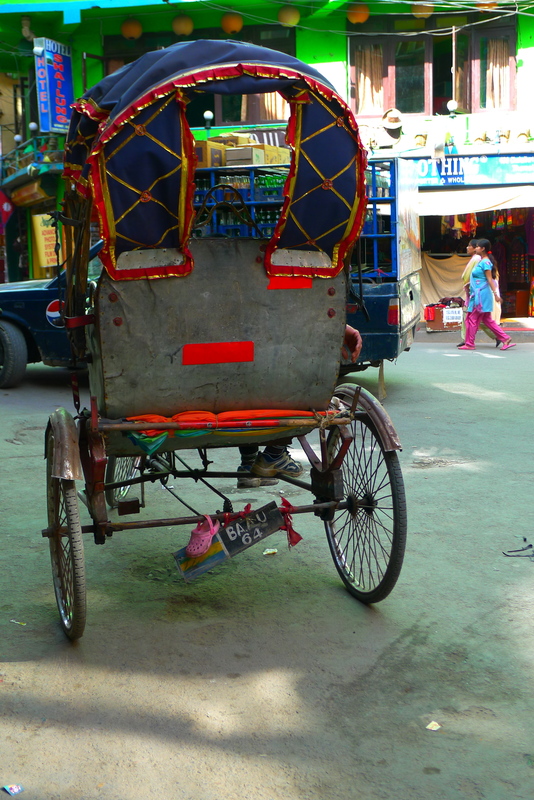 It wasn’t a particularly good picture, but I can still remember it: a bicycle rickshaw parked at an intersection with some mass of litter behind a wheel. The image was so different from anything I had seen in person, at that point I had only ever been around the US, France and Italy, that I was instantly enchanted. Everything else I had planned for that summer seemed to fall away. My whole being became consumed with wanting to stand in person in the middle of that picture and know that space. And so, off I went. 19 years old with 2 overweight bags, 3 boxes of cheese and peanut butter crackers, a dozen bottles of water (which eventually got left behind at the airport), and a pair of hiking boots hanging off of my bright yellow backpack. I was a sight to be seen, if not at the airport in D.C. then certainly at the end of the muddy, puddle filled alleyway leading to my hotel in Kathmandu. I was finally in my picture, and I was about to find the definition for my adult self. Those 3 weeks in Nepal and subsequent 9 weeks spent traveling elsewhere, would shape my view of the world and change the path of my life. 12 years later that path has led me back to the same, now paved, alleyway. My bags are a little lighter this time around and my hiking boots are on my feet. Nepal too is different than when I was here last – a king has been killed and another dethroned. 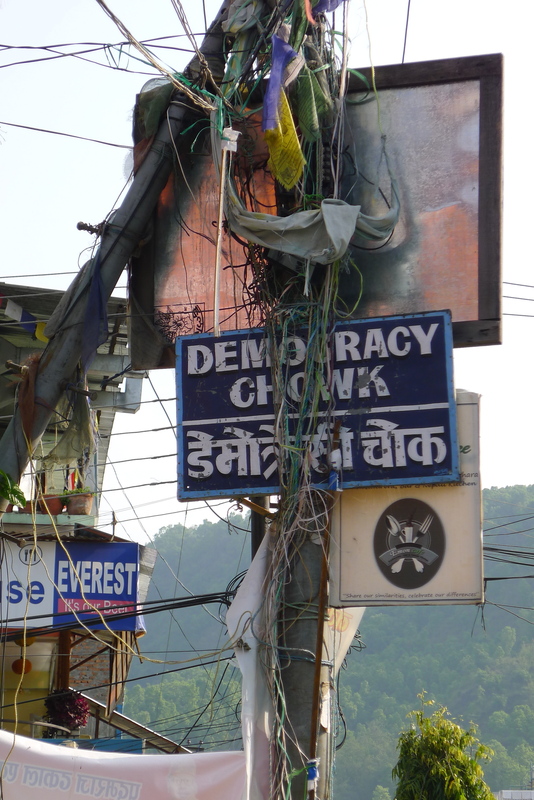 The stretch of mountains, valley, and plain that were the Hindu Kingdom of Nepal has become a secular democracy, or at least it carries the faint perception of one. The per capita GDP has doubled, making the country still one of the poorest in the world but infused with this new energy of possibility. Walking around the streets of the capital, I realize that we have switched places, this new Nepal and I. I have come back to Nepal as an adult, while suddenly it is the one caught in that awkward freshman place of not quite being a kid but still being unsure of how to define itself. Even a small amount of time spent here makes it obvious that this will not be an easy search for the country. Currently the Nepali government is in gridlock trying to write a new constitution. I wonder and ask the people I meet, “will they be able to get it right this time?” After so many years of bloodshed, so many lives lost, and so many dreams broken, this country deserves to find its own picture, something that will inspire its people to put past loyalties and disagreements aside, a definition of itself that is so mesmerizing, that every Nepali will want to stand in the middle of it and know that space. For an informative brief history of Nepal and overview of the most recent political and civil conflicts, read Manjushree Thapa’s “Forget Kathmandu”. It’s personal, concise, and gives a great well-rounded picture of the country’s political situation.